Does any one have any suggestions of where to meet and sketch in Sydney? It would be lovely if the weather is as sunny as it has been recently ! 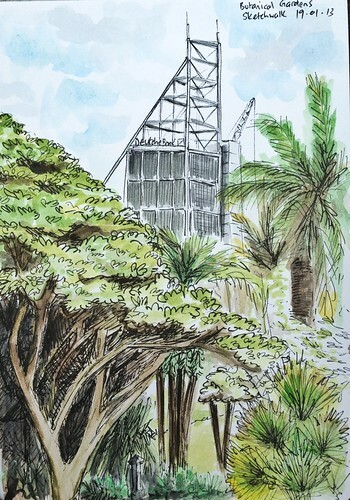 We suggest that we have a summer sketchcrawl in the Botanic Gardens - hopefully a sunny day, lots of shade and harbour breezes. 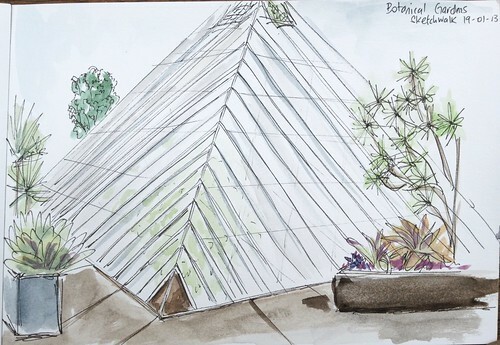 Meet at the kiosk/cafe at 10.00 in the middle of the gardens ...spread out as we want to and then meet back to share our sketches and have lunch at 12.30.
just confirming with anyone that sees this that we are meeting at the Botanic Gardens as per above. Sydney Sketch Club will be coming as well and we have a big group who have RVSPed saying they will come- over 50 people ... so we could have a great crowd and hard to miss. Look for people carrying a sketchbook! If you are thinking of joining a sketching group in Sydney, tomorrow will be a great way to start! There will be lots of first-timers..... everyone is welcome!!! Thanks for a fun morning Sydney Sketchcrawlers! A great day's sketching and a huge group of people all enjoying the Sydney Botanical Gardens. Oh I am so late posting this to the forum. I've had to miss a couple of sketchcrawls due to illness and I'd forgotten the routine. But I'm back. I went first to the succulent garden, then to the statue (which I've meant to sketch for a long time) and then to the bamboo. I'm working in a handmade book of coloured grounds at the moment, so this is on two colours of Canson Mi-Teintes. Both of you did some lovely sketches. Thanks for sharing! What more can I say but great work everyone,please keep it up. fine drawings . congratulations Sydney !